support to the users, their families and the community. 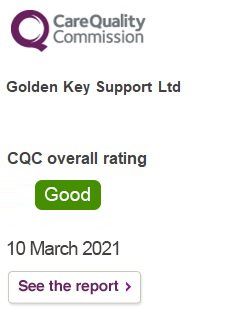 Golden Key Support is a proud Care Quality Commission registered service provider in England. Golden Key Support provides a full range of domiciliary care and support. We want our clients to have fun – regardless of whether this involves a day out shopping, a trip to meet friends or enjoying something less active, like listening to music at home. Regardless of the level of support needed, a member of the Golden Key Support team is available 24 hours a day, 365 days a year, to help in any way we can. At home in the free non-limiting environment we maintain the highest level of activity ensuring an uncompromising level of service 24/7. Its Golden Key Support’s guarantee to provide DBS cleared, qualified & experienced carers! We pride our team of diverse workforce as we have carers & support workers who are bilingual and trilingual from all ethnicities. We always respect the wishes, preferences and dignity of our customers. We can even provide respite support to people who are caring for someone else. We offer an alternative to having to move to a residential or nursing home live-in home care has many advantages – independence, quality of life, financial and more. Our carers are fully trained to help people of all ages, at all stages of their lives. Live-in elderly care from Golden Key Support works on your terms in your home, from professional carers who are dedicated to solely supporting you with dignity and respect. We are aware that living with a physical disability can mean that completing simple day to day tasks can be quite challenging. We support those with a wide range of learning disabilities. At Golden Key we recognise that people may require a person centred care so we provide support to service users to have a good and meaningful life. At Golden Key, our team receive on-going training in helping people get around safely and helping them cope with the effects of conditions such as dementia, muscular dystrophy and Parkinsons. So, whatever your requirements our team can provide the extra help you need. We provide services to help you remain independent in your own home, including personal care, cooking, shopping. Golden Key Support offers a full range of high-quality cleaning and maintenance services for your home. we pride ourselves in offering clients the highest quality care and support possible; regardless of the level of need or dependency.